The New Balance Men’s 990V3 Running Shoe is the latest product from the New Balance 990 series. These shoes have been designed to provide people who are constantly on their feet with maximum comfort and support. These shoes bring the latest technology together with a classic design to provide customers with a product that looks and feels good. I found the New Balance Men’s 990V3 Running Shoe to be a bit pricier than other shoes I’ve used for running before – but that extra bit may just be well worth it. These just may be the most comfortable shoes I have ever put on! Running is a hobby of mine and my job requires me to move around constantly – so I’m always on my feet. I’ve had these shoes for a few months now and have not had any foot cramps or fatigue since putting them on. I did run through the rain a couple weeks back and the shoes started smelling like cat urine or some other rancid odor, but I was able to clean it after some effort and have had no problems since. I love the feel and comfort of these shoes, but I am rather disappointed that getting water on them causes such a horrid stench, the removal of which is a major hassle. I give them four out of five stars. Firmer and softer foam density for better cushioning and support is provided by the dual-density foam collar. This feature makes these one of the best running shoes for plantar fasciitis on the market. The heel is supported firmly without the rigidity found in other shoes that causes heel pain. Suede and Mesh upper give the New Balance Men’s 990V3 Running Shoe a lightweight feel and a classic look. Indeed, you may not be able to tell these shoes apart from any other sneakers just by looking at them. However, once you put them on, you will notice the difference straight away. Unlike other shoes, these are designed to not weigh wearer down and many runners have reported feeling like they weren’t even wearing shoes on their feet. ENCAP® midsole cushioning provides top-notch support for the middle of the sole. Nothing makes the middle of the feet throb in pain like running or just standing up all day. Thanks to ENCAP®, people who wear this shoe can be sure of lasting comfort throughout the day. Of the well over one thousand reviews, most have been generally positive. 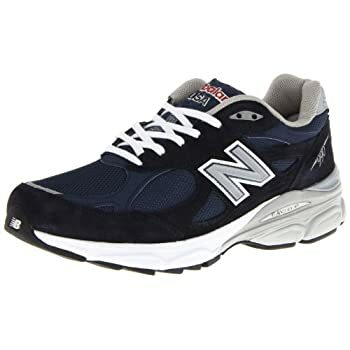 The New Balance Men’s 990V3 Running Shoe enjoys a relatively high rating on Amazon with 4.5/5 stars. Nearly all customers praised the quality of comfort (even those who gave negative reviews were generally satisfied about the comfort). The shoes have also received high praise for their foot support and flexibility. The negative comments generally have to do with customers smelling an odor like cat urine when the shoes get wet and a general lack of durability, with many customers reporting the sole breaking down within just one year of using the shoes. In general, customer service was helpful and offered unsatisfied customers credit towards a new pair of any New Balance shoes (not just this particular model). The smell is bad and it is annoying, but not insurmountable – it just takes a little effort to get them clean. New Balance has come out with something special this time around. Although there are complaints about odor and wear and tear, the comfort and flexibility provided just can’t be beat. You may need to be more careful with these shoes than you would with other sneakers, but for comfort, strength, and feel the New Balance Men’s 990V3 Running Shoe is in a class of its own.